Organic Spelt and Chia Hundreds and Thousands Cookies AND my contribution to the very first crowd sourced Bioglan Cook book- with your chance to win one coming up too. These cookies have been popping out of the oven in our kitchen for years in one form or another. Just recently I decided that they could be so much more. 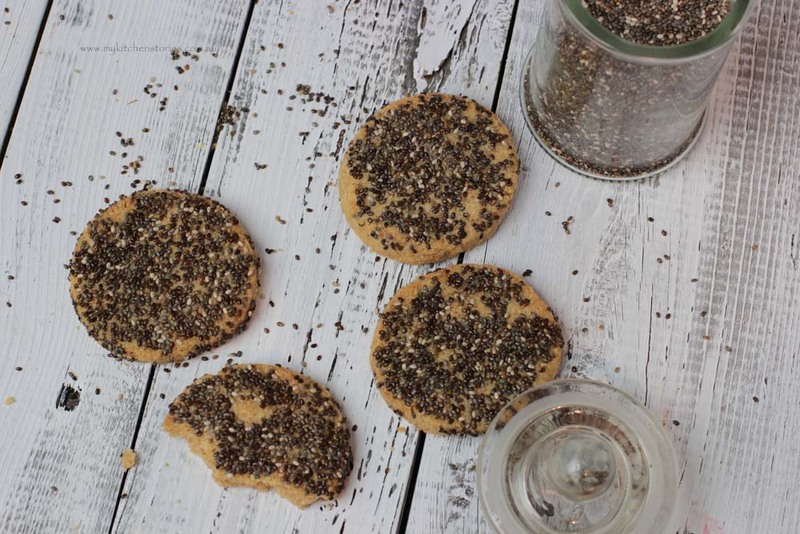 They don’t have many ingredients but what they do have could be far better, and then they would not only be fun biscuits but they would be incredibly good for you too. Dah dah….! 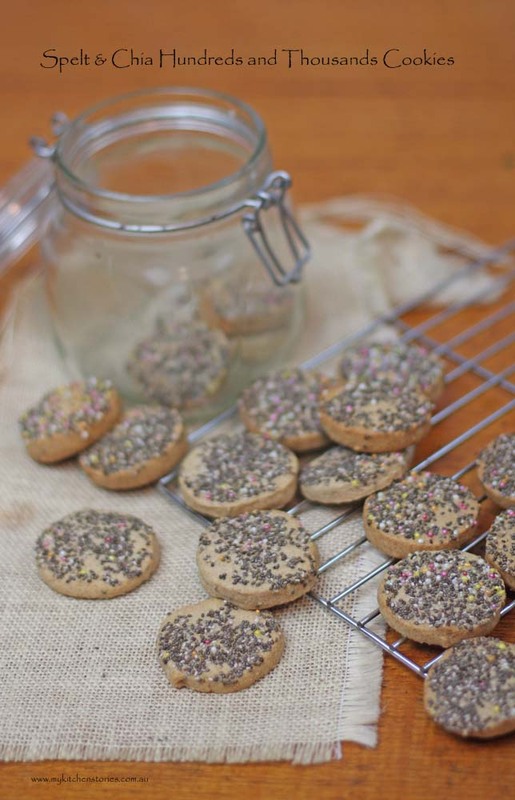 The Spelt and Chia Hundreds and Thousands cookies were born. It is a crowd pleaser with young and old and nobody knows how good they are for you, and that’s the best don’t you think? I don’t always have to tell everyone each time something is good for them and I don’t want to constantly hear it myself either but I will just wax lyrical about Spelt flour for a minute because I think there is some confusion about it. Spelt (also known as Farro) is one of those grains that gets written about and the information gets lost in translation. Lets keep it simple. Spelt flour – what is it….and should I care? Spelt grains are from the wheat family and it is definitely NOT gluten free, however its nutrients are far more easily absorbed than industrial wheat. It sounds so good. Why don’t we grow more of it? It’s a very interesting story, don’t you think? It’s all part of our evolving world food landscape. When baking I use both the Kialla Organic spelt flour and the Kialla stoneground wholemeal spelt flour. The plain spelt flour has less whole bran and is a little lighter. This is the one I have used for these cookies. 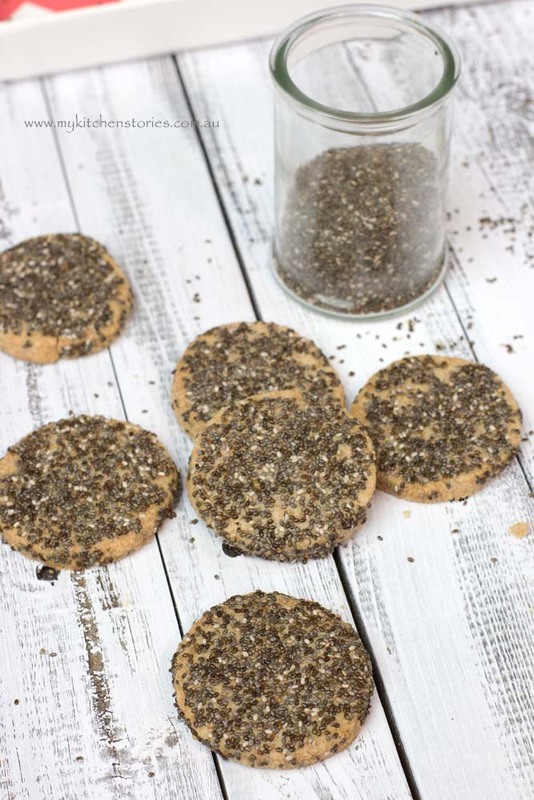 They are dipped into whole chia seeds instead of the luridly coloured hundreds and thousands I used to use. I don’t find the kids mind at all, in fact the crunchy nutty chia seeds are more fun, but if you wanted you could add just a sprinkling of colour by mixing the coloured hundreds and thousands into your Chia seeds like the ones below. 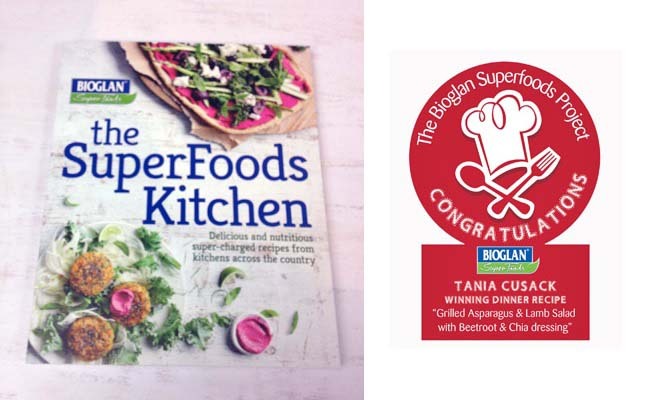 Now, a few months ago I wrote a recipe for Bioglan Superfoods and won a great prize and had my recipe published in the first crowd sourced recipe book using Superfoods. I have to tell you it is a beautiful book. I have 3 copies of the book to give away. Leave a comment on this post telling me why you would like to win one. The draw is open to anyone anywhere. No matter who you are you will love this book. Get commenting. 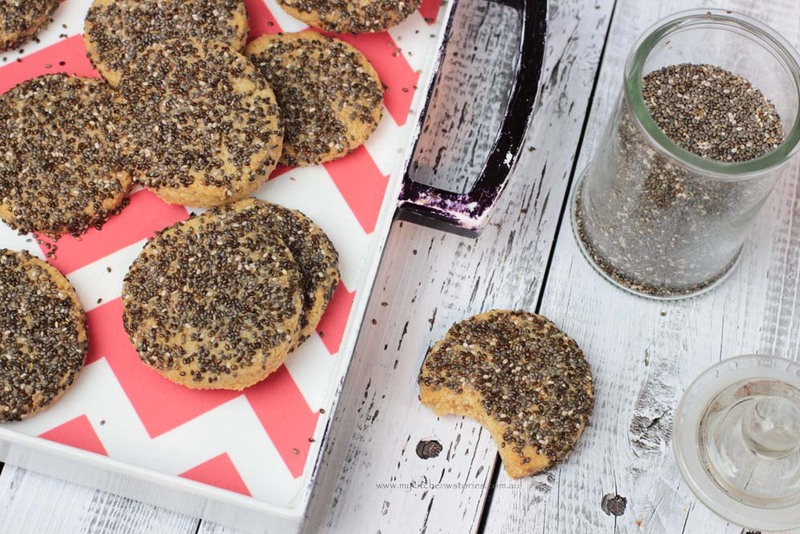 Here’s the recipe for the Spelt and Chia Hundreds and Thousands Cookies. you can have your own little superfoods party. Make these cookies in the food processor. It is the best and quickest way to whip them up. Set the oven to 170 C. Line a flat baking tray. Put all the ingredients except the egg into the bowl of your processor and whizz till combined. Stop. Beat the egg and pour into the processor. Whizz again until the dough starts to stick together and forms into a ball. No longer. If by chance the ingredients don’t start to stick together add 1/2 tablespoon of the extra liquid and whizz. Extra liquid will change the crunchy texture of your cookies. Only add if absolutely necessary. Unwrap the sausage and cut the cookies into 1-1/2 cm thick. Round them up a bit as one side will be flat where the dough has rested. Bake for 12-15 minutes. This will depend how thick you have cut your cookies. They are a bit better thinner. They will feel firmish in the middle when touched when they are done. I use both Organic Kialla Spelt Flour (Australian) and a company I love and Italian Organic Farro flour from Lario Food and Wine Co. All opinions are my own based on cooking with these products. The very first time I had bread made with spelt flour was the day after I received my Thermomix and I headed to the health food store to get grains to make into my own flour. I loved the different, little bit nuttier flavour of the bread. I’d love your biscuits but I’d call them cookies every time because I wouldn’t be paying attention. Ha Nagi, I didnt miss that calling I did that for a while, but hey thank you for saying such a lovely thing! 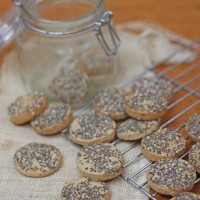 I love spelt flour, and these cookies sound fab. Who says “healthy food” can’t be delicious! Lovely! I have seen plenty of recipes with spelt, but have not yet tried it… it seems $$$ around here… and I’m also not sure if it would sit well with my medical issues at present. But love your recipe. Very yummy. I would like to win this beautiful cookbook because, I am just getting into superfoods and would love to learn more about them and be inspire by the beautiful recipes in this book! Oh sad about that ….I do so understand. Good Luck! 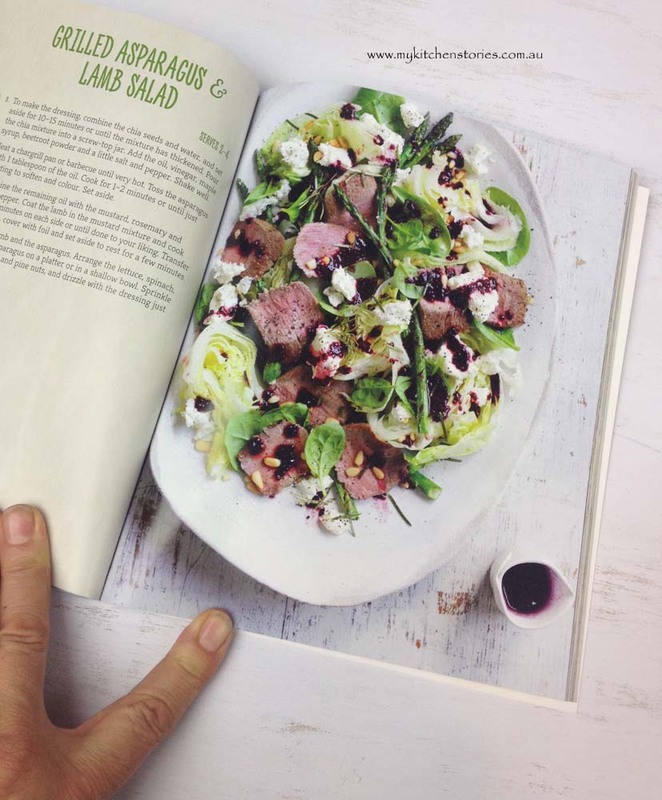 Congratulations on your cookbook feature Tania. And really interesting about how the need and want for faster grains pushed spelt away. Lorraine @ Not Quite Nigella recently posted..Easiest Thai Red Curry Roast Chicken, Pumpkin & Spiced Rice! Congratulations on the cookbook feature and I love this recipe. A real creative way to use these ingredients.